Many ethical issues are uncomplicated. There’s no reason to debate whether it is appropriate for social workers to enter into business relationships with clients (a blatant conflict of interest) or falsify clinical or billing records (fraud in the purest sense of the term). These are the easy issues. In contrast, social workers occasionally face remarkably daunting moral choices that resist simple or easy answers. In fact, some of these dilemmas seem downright intractable. Here’s an example of one of the most challenging cases I have encountered: I received a telephone call from the executive director of an agency that provides social services to children and families. The agency serves a large rural area. One of the agency’s prominent programs serves children in therapeutic foster care, many of whom have severe trauma histories (physical and sexual abuse), developmental delays, and learning disabilities. In addition to providing counseling and case management services, agency staffers also do their best to find adoptive homes for these youth as part of their “permanency planning” initiative. As is common in such programs, the agency encountered a great deal of difficulty finding suitable adoptive homes. Many people who are interested in adopting prefer younger children and those without severe trauma histories and disabilities. Also, the agency’s rural, sparsely populated location added to the challenge. One of the agency’s social workers provided case management services for a 10-year-old child who had been the victim of protracted physical abuse and neglect. For many months the agency had tried, without success, to find an adoptive home for this child. The social worker cared deeply for the child and decided she would like to adopt him. She shared her wishes with the program’s director and the agency’s executive director. All of them recognized the potential boundary-related challenges. When the agency director called me for consultation, she shared the staffers’ struggle to reconcile their conflicting instincts: to provide a stable home for this vulnerable child while maintaining clear professional boundaries. The consensus among staffers was that they were not likely to be able to find an adoptive family and wondered whether their moral duty to care for the child outweighed their duty to avoid complicated boundaries. This is the sort of case that pushes the proverbial envelope. The concept of pushing the envelope has nothing to do with the paper container in which one places a letter. Rather, this phrase came into general use following the publication of Tom Wolfe’s book The Right Stuff about the U.S. space program and efforts of astronauts and test pilots to push the limits of their human potential. In this context, the term envelope is a mathematical one; in geometry, the envelope is defined as the locus of the ultimate intersection of consecutive curves. For example, the set of lines described by the various positions of a ladder sliding down a wall forms an envelope. This would form an arc that gently curves away from the intersection of the wall and floor. Inside that envelope one would be hit by the ladder; outside the envelope, one would not. How are social workers to manage ethics cases that push the envelope? What happened in the case involving the agency staffer’s potential adoption of the 10-year-old child is exemplary. Agency supervisors set out to develop rigorous and comprehensive guidelines that conform with key values, principles, and standards in the NASW Code of Ethics. Together we reviewed pertinent ethics-related guidelines concerning conflicts of interest, boundaries, and dual relationships. We then considered the nature of the staff member’s role at the agency and relationship with the child in question. • The type of case: This factor refers to whether the case goal is reunification, adoption (parental rights already terminated), or foster care (no family involvement or plans to reunify and parental rights not terminated). The nature of the agency’s responsibilities to children and youth, parents, and extended family were likely to differ depending on the type of case. • The role of the agency staff member: This factor refers to whether the staff member has had responsibility for the case, specifically for planning and decision making. When an agency staff member is directly involved in planning and decision making for the child, there are likely to be ethical concerns (conflict of interest) related to the individual’s involvement as a permanent family resource. For example, the group concluded that a social worker would be eligible to adopt a child only if the social worker had not been involved at all in planning for the termination of parental rights. This was to avoid a conflict of interest, or the appearance of a conflict of interest, regarding the social worker’s interest in termination of parental rights in order to facilitate adoption of the child by the social worker. • The programmatic assignment of the agency staff member: A third factor concerns whether the interested staff member works within the division responsible for the child. Employment by the division that is charged with planning and decision making for the child or youth may raise ethical concerns regarding the staff member’s involvement as a permanent family resource. At the same time, the agency recognized that the professional staff in the division that serves the child are the adults that the youth already knows and may be the most likely permanency resources for him or her. The group also decided to include rigorous supervision and an ethics-related review of any proposed adoption of a child by an agency professional. First, a supervisor would need to review the arrangement to ensure that there was no conflict of interest or inappropriate dual relationship. Second, the agency established an ethics committee that would provide an additional layer of review. The ethics committee included the agency’s director of clinical services, a member of the agency’s executive committee, a division director or deputy division director, two supervisors, and one outside consultant who is knowledgeable about social work ethics. Ideally, this child would be adopted by parents who are not staffers at the agency. However, in the event that exhaustive efforts failed to produce a satisfactory adoption arrangement for the child, the ethics-informed guidelines enhance the likelihood that the child’s compelling need for a family will be addressed while adhering to strict ethics guidelines pertaining to conflicts of interest, boundaries, and dual relationships. Years ago, I learned about the concept of satisficing. The term “satisfice,” coined in 1956 by American economist, political scientist, and Nobel laureate Herbert Simon, PhD, is a combination of satisfy and suffice. I think this concept is relevant when challenging ethical issues arise in social work and there are no easy answers. Satisficing is a decision-making strategy discussed in economics that aims for a satisfactory or adequate result, rather than the ideal or optimal solution. This is because in some circumstances, aiming for the optimal solution may not be feasible or even possible. Simon argued that rational choice is not always possible and that, at times, “psychological realism” is necessary. This is especially so in the face of what Simon calls “bounded rationality,” that is, situations where people have limited information and options and a finite amount of time in which to make a decision. Simon introduced the concept of satisficing primarily for application to the field of economics. However, the concept seems equally applicable to instances when social workers must make extraordinarily difficult ethical decisions with limited information, options, and time. 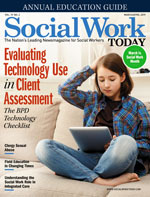 In these circumstances, when social workers feel the push of the proverbial envelope, ethics-informed satisficing would seem to be the order of the day.